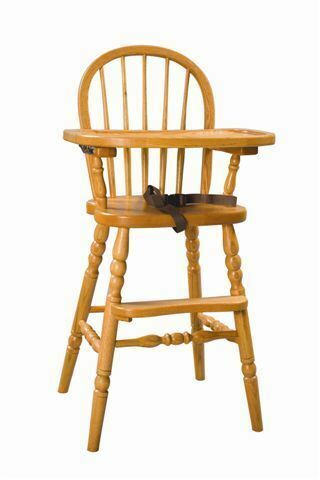 The Amish Lancaster Bow-Back High Chair is something very special. Handcrafted to order in a small Amish woodshop in the northern United States, the Lancaster is a solid wood high chair that traces its heritage back to the very earliest days of the traditional American family. Its traditional quality is reflected both in its classical style and in its heirloom construction and build. Each of the Lancaster's surfaces are hand-sanded for a stunning look and feel that mass-produced pieces just can't match. Every piece is built to order from your choice of American oak or cherry wood - keeping this high chair strong and beautiful for as long as the kids, the grandkids, and the great-grandkids need it to be. It's our belief that some of the finest memories life has to offer come in the small moments that we spend with our families at home. The kitchen is a natural gathering place, and the Lancaster's ideal height, slide-out tray, and added safety straps give it everything it needs to offer the family's smallest members a safe and comfortable place join in mealtimes. Crafted in your choice of wood and stain, this is a piece that wants to fit into family life and continue to serve it for generations yet to come. Customize your family's Lancaster Bow-Back High Chair. This high chair is crafted in your choice of wood and stain and you can select a semi-gloss varnish or matte varnish to finish off your purchase. If you run into any questions at all - or if you would like to see free samples of any of our woods and stains - please don't hesitate to reach out to our team by phone or by email at any time. Like our Amish woodworkers, we value our kids more than anything else in the world, and we would love to talk with you about the magic we've experienced in sharing our meals with them. Call us today at 866-272-6773 or shoot us an email at Questions@DutchCrafters.com. Tray Has 3 Notches - Adjustable from 4 1/2" - 6 1/2"
My black highchair arrived and is just what I wanted...thank you so much and congratulations on having such a well made piece of furniture.